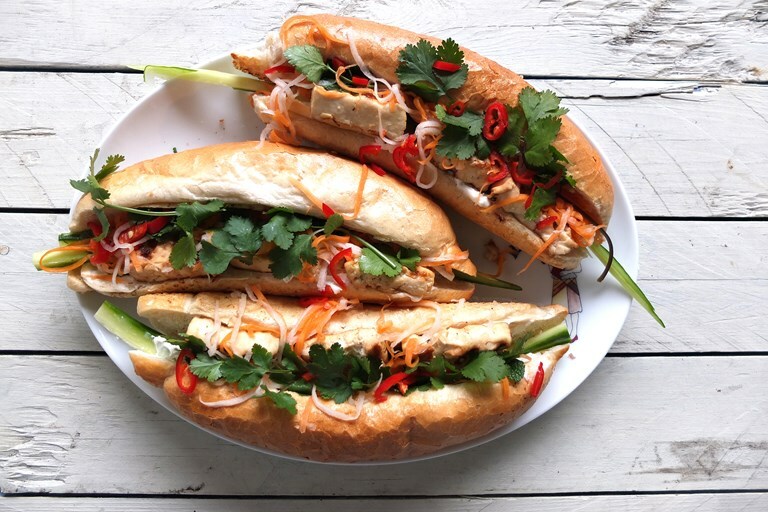 Helen serves up a stunning tofu bánh mì recipe, marinated in a heady mixture of lemongrass, fish sauce, coriander and garlic for a delicious take on this classic Vietnamese sandwich. The bánh mì is one of the world’s great sandwiches. This glorious mash up came about as a result of French colonial rule in Vietnam, when French ingredients like baguette, mayonnaise and pâté were combined with chilli and pickled vegetables. People tend to associate the bánh mì with pork, but there are other interesting fillings to try. You’ve probably guessed by now that tofu is one of them. One of the greatest properties of tofu is its texture, and this recipe should give you the right balance of crisp outer skin and soft, wobbly interior.